Estonia held a parliamentary election on 1 March. Allan Sikk writes that while the nature of the coalition which emerges from the election remains to be seen, the result was another success for the Reform Party, which has been in government continuously for the last sixteen years. 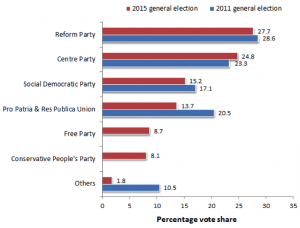 The most significant, although predictable, result of the 1 March general election in Estonia was another electoral triumph by the Reform Party (RE). RE has been part of governing coalitions continuously for sixteen years, and has held the position of Prime Minister for the last ten years. It is fairly likely to continue at the helm of government until 2019, cementing its dominance in Estonian politics. 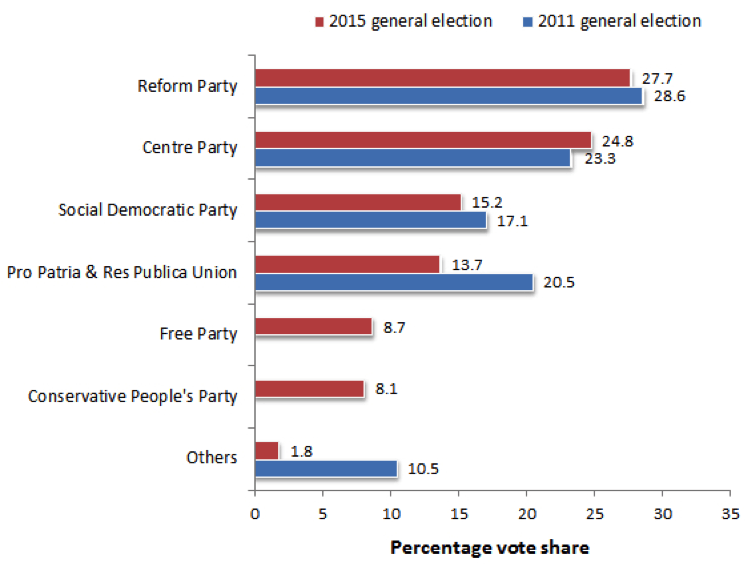 The chart below shows the results of the 2015 election and the previous general election in 2011. Chart: Results of the 2015 and 2011 Riigikogu elections (click to enlarge). Note: Figures from National Electoral Commission. For more information on the parties see: Reform Party (RE), Centre Party (KE), Social Democratic Party (SDE), Pro Patria & Res Publica Union (IRL), Free Party (EVA), Conservative People’s Party (EKRE). Even though two new parties entered the parliament (more on them below), the election was also characterised by stability. The vote shares of three out of the four erstwhile parliamentary parties changed little, as did electoral turnout (64 per cent). Only the conservative Pro Patria and Res Publica Union (IRL) suffered a notable loss of votes (6.8 per cent), mostly to the two new parties. The continued success of RE can be explained by three factors: national security concerns, a successful leadership change, and a shrewd political strategy. As the incumbent, RE benefitted from voters seeking stability confronted with an increasingly aggressive Russia. In its campaign, RE emphasised the need for stability and boosting national defence. RE used NATO fighter jets as a backdrop for one of their campaign clips, for which it was criticised in the media, but this nevertheless helped cultivate among the voters an image of a party that prioritises defence.